“Opposites A-Frack” offers more than a few opportunities for comparing and contrasting. Burns falls in love again, Homer gets a new job again, Burns asks Homer for romantic advice again. I even briefly contemplated comparing it to those episodes on 30 Rock where hyper-capitalist Alec Baldwin has a secret affair with ultra-liberal Congresswoman Edie Falco, just for a change of pace. But Burns drilling for gas underneath Springfield is too on the nose from “Who Shot Mr. Burns? Part 1” to pass up. Lisa: This whole building is just a facade for a drilling operation. Burns: Indeed it is. Evergreen Terrace is built atop a massive shale deposit. Burns: That’s it, frimble about with your widgets and dobobs. It’ll all be a monument to futility when my plan comes to fruition. Look at that quote! He isn’t merely content to drill for oil and screw over everyone else, he’s also gleefully anticipating the moment when his plan will dash their hopes. That’s Burns at his evil best. Moreover, Burns’ plan, both the drilling and the eventual sun blocker, don’t require him to do anything as patently stupid and self defeating as relying on Homer Simpson. Season 26 Burns, of course, does exactly that. Not only does he ask Homer to get the mineral rights contracts signed, but he compounds his mistake by trusting that Homer did it instead of making sure. That last part is especially un-Burns-like because Burns himself is the one who discloses that not all the signatures are there. What!? Can you imagine Season 6 Burns stopping his drilling operation because he and only he noticed that one signature was missing? If anything, breaking the law without anyone knowing would appeal to him. The watered down Burns of “Opposites A-Frack” isn’t remotely the kind of distilled malevolence of the Burns in “Who Shot Mr. Burns?”, but Zombie Simpsons wants us to still think of him like he is. When, after his grossly out of character explanation to Lisa, Burns refers to the houses on Evergreen Terrace as “shanties and lean-tos”, we’re supposed to laugh at the contempt he has for regular people. But the contempt isn’t there anymore because we just saw him pop-up out of nowhere to help Lisa understand things. A similar hollowing out affects poor Smithers. In “Who Shot Mr. Burns?”, he becomes increasingly conflicted about Burns crossing over from every day villainy into cartoonish super-villainy. We see his qualms grow alongside the drilling operation (look at him in that picture at the top), and the sun blocker finally breaks him. In “Opposites A-Frack”, Smithers basically vanishes for the entire episode. It’s not as jarring as when characters appear for no reason, but unexplained disappearances happen almost as often. 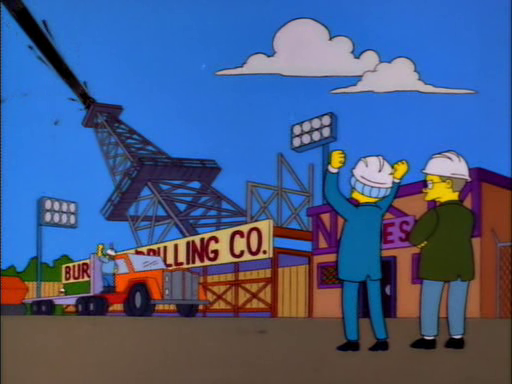 Consider that when Bart and Lisa easily walk into the “secret” drilling facility, Smithers just stands there. By the time Burns gets to that pointless committee hearing, Smithers isn’t even there. Nor is he present when Burns barges into whatshername’s office. Smithers is there when Burns selects Homer as his salesman, but literally doesn’t say a single word. He is similarly absent when Burns asks Homer for romantic advice, both in his office and then again back at Burns Manor, which is even weirder because he’s at the door and then vanishes again. Smithers . . . No Smithers. Why did the man who never leaves Burns’ side disappear into thin air? The next scene is Burns asking Homer for advice, and Smithers wasn’t required. As usual, Zombie Simpsons forgets anything that isn’t happening right now. Finally, in both episodes Burns drilling causes an earthquake. 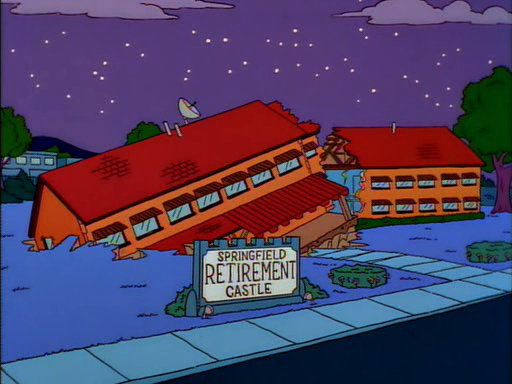 The Simpsons handles it by having Grampa jump out of bed, shout “Earthquake!”, and then stand in his doorway while the entire Retirement Castle falls into a sinkhole. The old people can’t do anything but call for the nurse. One is quick and punctuated with a joke. The other is slow and punctuated with an explanation. Season 6 Burns has a diabolical plan that he springs unexpectedly and sees all the way through. Around him, his henchmen and his victims are their normal, hilarious selves. Season 26 Burns has a dumb plan, explains it patiently, and then bungles it himself. Around him, the show has to essentially airbrush Smithers out of the episode and constantly tell us what’s going on. You can build great television around the real Burns, but you can’t even come close with the vacuous shell Zombie Simpsons has made of him. Smithers’ conflict in Who Shot Mr. Burns has one of my favorite little character touches – Smithers always refers to Burns as “Mr. Burns” or “Sir”, but when he calls Burns out on the sun blocker, he calls him “Monty”. A last ditch effort to reach his too-far-gone boss on a more personal level. I can’t imagine the show tending to little details like that today. Totally agree with that comment. The Simpsons of old did a really good job when they needed to add depth and history to it’s second tier characters. For example , when Krusty reconnects with his father in season 3. It was always done with realistic backstory and just the right amount of emotion. Compare that with how zombie simpsons deals with Edna K’s (RIP Marcia) backstory where they tack on the idea that she had been in a relationship with Moe at one point despite the characters having never interacted much before. And don’t get me started on Skinner. Something else to comment on with that scene: Mr. Burns actually addresses Smithers as “Waylon.” While that ties into the point you’d already made, it also serves as a reminder of Smithers’ given name to regular but more casual viewers of the show for the sake of the WS/MS theme of the shooting suspects. That little detail is one of the ever so many nifty ways The Simpsons was good at providing depth and mutiple interpretations of dialogue and details, and also how the writers were good at not making stuff seem forced or out-of-place in terms of tone and characterization when it served a special purpose–one of several touches that I’m bitter about being absent from Zombie Simpsons. Our water was on fire! Our water was on fire! Our water was on Fire!